Last week, Governor Jerry Brown turned up on public radio's Science Friday program, urging scientists to stand up and be heard on the impacts of climate change and other "existential threats," from mass extinction of species to nuclear war. "Catastrophe -- it does loom," said Brown, calling on scientists to, "speak the truth as they know it and thereby combat the error and the falsity that is spreading like a cancerous plague." This week, more than 2,300 faculty members from Caltech, the University of California and Cal State University systems responded by sending an open letter to President Donald Trump, imploring him to rethink his position on climate change. The letter, written by Berkeley astronomer Aaron Parsons, urged Trump and his administration "in the most urgent terms possible" to stand by the international climate agreement signed in Paris by the U.S. (under President Barack Obama) and nearly 200 other nations. Trump has threatened to "tear up" the agreement, while on other occasions saying he has an "open mind" on the matter. The letter, to which signatures are still being added electronically, warns that the rapidly warming globe will lead to "catastrophic, unstoppable consequences," if "bold and decisive action" isn't taken to reduce burning of fossil fuels. Trump has aggressively promoted fossil fuels, with his words and appointments . "We're really at a critical crossroads here and there doesn't seem to be any time to lose," Parsons told KQED. "And I really felt compelled to have to do something about it." Parsons is under no illusions that the letter will be taken to heart in Washington. "I'm pretty sure the people to whom this letter is directly addressed are going to ignore it," he said. 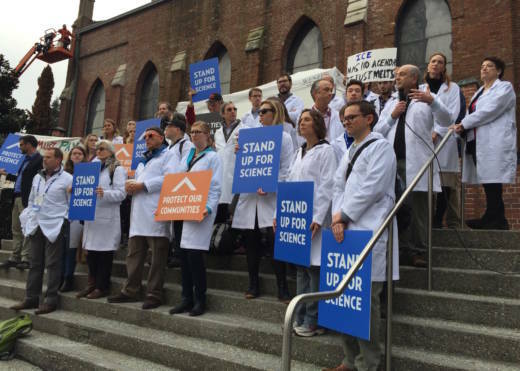 Parsons explained that he hopes the effort will spur more people within the science and academic communities to stand up and be heard, and also that California's state and federal representatives will rally to the cause. Parsons thus joins the ranks of academics such as Harvard's Naomi Oreskes and Ed Maibach of George Mason University, who have been calling on scientists to become more vocal advocates of, well, science, while well-established facts such as the warming planet and humans' role in that process continue to be challenged in the national political arena. "These aren't things that are, in our minds, subject to debate," said Parsons, "but if they're subject to debate in political circles, then scientists have to weigh in on that." And indeed, scientists are planning to weigh in with their own "March on Washington," scheduled for Earth Day, April 22. We the undersigned are calling on you, in the most urgent terms possible, to maintain our country’s commitment to meeting the greenhouse gas emission targets set forth in the Paris Climate Agreement. This agreement is the first of a series of steps required to avert substantial climate change. The Earth’s climate is entering a state that has not been experienced in human history. Continuing to produce greenhouse gases at current rates will have catastrophic, unstoppable consequences for our environment, our economy, and our country. Bold and decisive action may still avoid the worst scenarios, allow for adaptation to the changes, mitigate the damage, and bring new economic opportunities to our country. To this end, we ask that you ensure America’s place as the global leader on climate action. With this letter, we aim to express the degree to which the scientists and intellectual leaders of our state, speaking for themselves and not on behalf of their respective employers, agree on the facts of climate change. Despite misleading portrayals, there is widespread consensus in the scientific and academic communities that human-caused climate change is real, with consequences that are already being felt. The science of how greenhouse gases trap heat is unimpeachable. Climate records are being broken as human-caused changes add onto natural oscillations (e.g., El Niño) in the climate system. Fossil records from pre-human times show much higher sea levels and a reorganization of vegetation patterns when greenhouse gases were higher and Earth’s climate was much warmer than today. Increasing levels of greenhouse gases in our atmosphere set in motion regional variations in weather, weather extremes, the loss of major ice sheets, and declining biodiversity that has been associated with mass extinctions in Earth's past. Scientists have warned for decades of the dangers of overreliance on fossil fuels. The world has been slow to respond and, as a result, we run an increasing risk of major damage to America’s economy and security. We have had an unusually large number of serious natural disasters in the past decade that are in line with climate change predictions. The Southeast and West suffer from increasing droughts. Miami floods at high tide as sea levels rise. Major cities on the Eastern and Gulf coasts regularly suffer major damage from violent weather. Western forests die because winters are insufficiently cold to prevent insect infestation of drought-stressed trees. Left unchecked, the frequency and severity of these climate change events will increase with time, as will their economic impact. To secure and conserve our way of life, our economy, and our environment, we need immediate action. The United States now has a unique opportunity to lead the world in developing innovative ways to reduce greenhouse gas emissions. By investing in and incentivizing clean energy and carbon sequestration technologies now, we position ourselves to be the economic and political leaders of the 21st century. To do otherwise cedes these opportunities to others and undermines our national security, food security, water security, and the future of our children and grandchildren. For these reasons, we ask you to maintain and increase our country’s commitment to taking action on climate change, beginning with the current Paris Climate Agreement. 2344 faculty members, (as of 5 p.m. Tuesday) listed on the following pages.